What a cool invitation! I was asked, not long ago, to be on the judge panel for the Flashforward2007 Film Festival. I’ve seen over 100 entries, many of which were truly what I’d call “cream of the crop” examples of what Flash is all about. I’m looking forward to the conference itself in September! I’m always happy to meet people I’ve come to know online. On Thursday, July 12, 2007, a hefty box arrived at my doorstop. Inside? 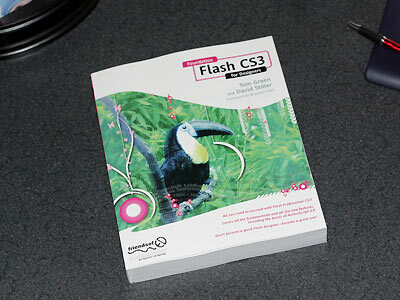 My author’s copies of Foundation Flash CS3 for Designers, written by Tom Green and me. What a way to perk up the afternoon! You are currently browsing the David Stiller’s blog weblog archives for July, 2007.